Affordable energy not only fuels our vehicles and electrical plants, it also fuels our economy and our quality of life. However, most of today's energy technologies release carbon dioxide (CO2) into the environment, and there is growing concern that CO2 in the atmosphere might affect global climate and weather. The Plains CO2 Reduction Partnership Decision Support System showing the selection of oil pools (potential CO2 sequestration sites) within 75 miles of selected CO2 sources. The University of North Dakota Energy & Environmental Research Center (EERC) is leading an international team to develop opportunities for CO2 sequestration in the Great Plains of North America. This team, the Plains CO2 Reduction (PCOR) Partnership, is one of seven regional partnerships established by the U.S. Department of Energy/National Energy Technology Laboratory (DOE/NETL) to determine the most suitable technologies, regulations, and infrastructure needs for carbon capture, storage, and sequestration in different areas of the United States and Canada. Through the collaboration of more than 50 government, industry, and environmental groups, the PCOR Partnership is currently characterizing CO2 sources and sequestration opportunities in nine U.S. states and three Canadian provincesin all, nearly 1.4 million square miles. A major component of this characterization is creating an inventory of large stationary sources of CO2, identifying and mapping geologic and terrestrial targets, or sinks, for CO2 sequestration across the PCOR Partnership region. Knowledge of the character and spatial relationships of sources, sinks, and regional infrastructure is basic to developing and assessing approaches to economical CO2 sequestration. The most efficient way to communicate this information to the partners has been through a GIS-enabled Web site built with ArcIMS software, which was selected following competitive evaluation because of its versatility in both the GIS and Web environments. This site is a major component of a larger Web-based decision support system (DSS) that provides the research team with a single point of access to a wide variety of research data for the evaluation of sequestration data and the development of potential scenarios. This password-protected Web-based platform contains the tools and capabilities designed to deliver functional and dynamic access to data acquired through the project. The data is housed in a relational database and accessed through a map-based portion of the Web site. More traditional Web pages provide access to relatively static data, such as links to reports, CO2-related Web sites, terrestrial maps, and snapshots of regional data. 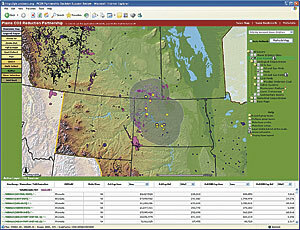 The Web-based GIS portion of DSS is designed using ArcIMS, which provides a scalable framework for GIS Web publishing. Examine attributes of individual features or groups of features and their spatial relationships to other features. Query the underlying data to analyze the region and export selected data for manipulation in other software. Explore the nature of the data through thematic maps. In addition to enabling the user to directly select features on the map, the site allows the user to employ advanced selection methods. The attribute query option is a powerful tool for finding and examining features and data based on specific data attributes. An alternative feature selection process allows for sink/source proximity analysis that can be employed through a spatial query. This approach uses the buffer tool to identify features that are located within a user-specified distance of currently selected features. 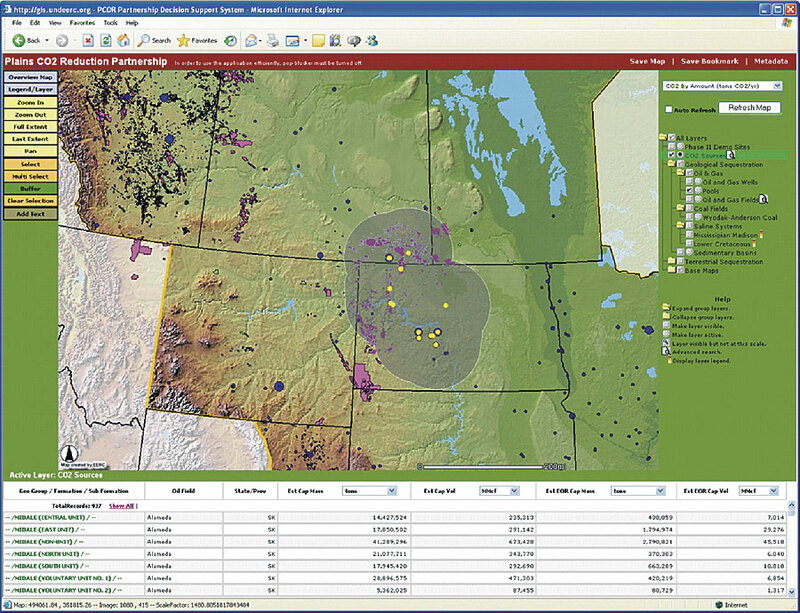 The Web-based GIS interface of DSS contains several themes of georeferenced data that are considered crucial for the PCOR Partnership project. This data includes detailed source and sink characterization information that has been collected or generated by the research team. Several base layers and associated characteristics are also available, including political boundaries, cities, regional geology, road and rail transportation, shaded relief, and land use. The majority of the source characterization data was gleaned from public data sources, such as U.S. Environmental Protection Agency (EPA) Web sites. The database currently contains information regarding all stationary CO2 sources in the PCOR Partnership region. Stationary sources include heat and power generation (utility, industrial, institutional, and municipal) and industrial facilities representing the food, fuels, chemicals, minerals, metals, paper/wood, manufacturing, and waste-processing industries. Largely, CO2 emissions were estimated using fuel utilization data or unit production emission factors (e.g., tons CO2/gallon ethanol). Sulfur and nitrous oxide emission data was included wherever available. Emission data is initially displayed in tons CO2/year (mass) and million cubic feet (mmcf) CO2/year (volume); however, the ArcIMS interface has a converter for users to select different units, such as tons CO2/year or mmcf CO2/day. The petroleum-related data (well and field locations along with associated management, production, and stratigraphic data) was provided by state agencies or gleaned from publications; however, the level, or detail, of available data was not always consistent from state to state. The database currently contains information on more than 400,000 wells with various attributes, including operator name, well name, total depth, well type, and well status. Reservoir characteristic data was obtained by researching state agency case files for fields with a cumulative oil production greater than 800,000 barrels. This data pertains to reservoir characteristics that are necessary to perform detailed field studies with respect to CO2 sequestration, including porosity, permeability, reservoir thickness, surface area, original oil in place (OOIP), cumulative production data, and water and oil characteristics. For more information, contact Wesley D. Peck, research scientist, Energy & Environmental Research Center, University of North Dakota, Grand Forks, North Dakota (tel. : 701-777-5195, e-mail: wpeck@undeerc.org), or Edward N. Steadman, PCOR Partnership program manager and senior research advisor, Energy & Environmental Research Center (tel. : 701-777-5279, e-mail: esteadman@undeerc.org). See also "Al Gore Discusses Environmental Sustainability."